Cavity Free Kids’ mission is to promote dental health in children. We believe all kids can be cavity free! Brush your child’s teeth as soon as they appear in the mouth, 2 times a day, 365 days a year! 1. Parents are to brush their child’s teeth as soon as teeth appear in their mouth. 2. 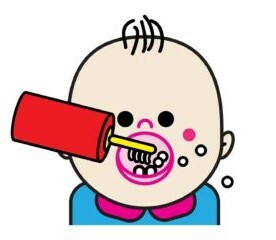 Brush your baby’s teeth twice a day and 365 days per year. 3. Brushing after the last meal of the day is the most important cleaning. The goal of the continuing dental educational program is to educate general dentists and their auxiliaries in the clinical procedures and behavior guidance techniques involved in the treatment of children, thereby increasing the dental professional’s comfort level and general acceptance of the pediatric patients and their parents. Dr. Peterson wrote “Oh My! 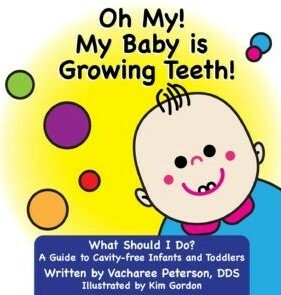 My Baby is Growing Teeth!” to help parents and care givers help children establish beneficial dental habits. This special design protects infants and toddlers from puncturing the throat! KEEP CAVITIES AWAY from new baby teeth! DO NOT let your baby go to bed with dirty teeth! Like dishes, they need to be washed after EVERY use! 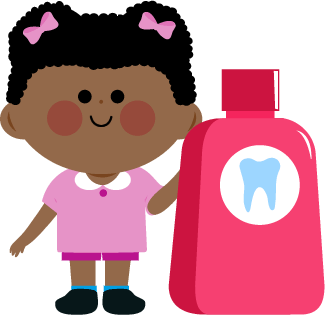 As soon as you see the first baby tooth, brush with toothpaste size of a rice grain 2 times a day, but especially after the last bottle or meal of the day — 365 days a year! A non-intimidating means of securing a child that provides for his/her safety in seconds. Just pull up the flaps and you are set! If you find that during the procedure this measure of security is not needed, simply undo the flaps. This device is made to provide patient safety during dental procedures. The Pedo Burrito has been tested on over 5,000 children with behavior ranging from uncooperative and fearful to out-of-control.